After consecutive nights of eating rich dishes from holiday dinner parties past days, my body was screaming for a simple light Japanese soup noodle. So, I made Nyu-men, which is basically somen noodle in hot broth. Combine 450 ml dashi stock, 1 tablespoon sake, 2 tablespoons mirin, 1 tablespoon light color soy sauce ("usukuchi shoyu") and 1 tablespoon soy sauce. Add some sliced gobo (burdock root, soaked in water for 15 min. and drained) and shiitake mushrooms and simmer in the broth until gobo is tender. Meanwhile, cook the somen noodles slightly firm. Drain and rinse in cold water. Drain again. To finish, add the noodles to the broth and heat for 30-60 seconds. Divide in individual bowls and garnish with some chopped mitsuba herbs. I also served a quick roasted yellowtail with ponzu sauce. 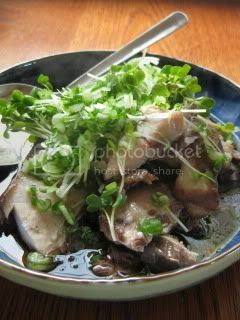 Yellowtail was roasted in the 450F oven until done, then served with ponzu, daikon sprouts and scallions. Detox meal...my homemade tofu etc. toiro news: New Iga-yaki products are in!